Months have passed since I’ve written. Fortunately, though, I’m back at it (I hope). I attended my first American Music Therapy Association National Conference that concluded just yesterday, and I am home and feeling energized and somewhat overwhelmed. I’m going to post only once per week. At the beginning of the month, I’ll offer a writing prompt. I’d love to read what music therapy and expressive arts therapy students, interns, and professionals have to say in regard to the prompt. I’ll review the pieces, let you know my thoughts, and put it out to a different audience than you might have yourself. You might have read a guest post by Lindsay Markworth, MMT, MT-BC in the past. 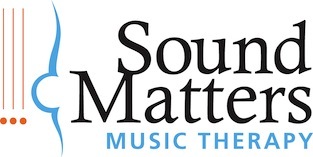 Also, Sound Matters Music Therapy, LLC, is seeking qualified sub-contractors to work in the southerly suburbs of the Minneapolis area. Please contact us for details. There is a Minneapolis-based peer group of board-certified music therapists meeting again this month. Please let me know if you have any interest. I’ve just returned from my regional music therapy conference, held in Rosemont, Illinois. We got home earlier today, and I went to see clients this afternoon. Surprisingly, I’m tired. I attended a number of fascinating presentations, but the most immediately applicable in terms of functional knowledge that I employed even today was the CMTE (continuing education) course on clinical improvisation. Of course we spent time developing our technical knowledge of modes and how to easily access them on piano (among myriad other techniques), but what I found the most useful, confusing, and encouraging was the time we spent translating our goals into music-centered goals. In other words, how, in the music, would we clinicians know a goal has been met? How would the music achieve the goal? How would the accomplishment sound? Music therapy cannot be compared to any other therapy, because the music in music therapy is an entity and a language all in itself. One of the conversations had in this course was surrounding music therapists’ definitions of our work, especially when we’re describing our work to someone who assumes we are music teachers. “Music therapy uses music to achieve non-musical goals” is a succinct and often-used way to speak about our therapy, but is it really accurate? Why do the goals we address have to be “non-musical?” How can we own the music in music therapy? What are your thoughts? I would love to continue this conversation. This week consists of two days of seeing clients, and then the Great Lakes Region Music Therapy Conference. I’m looking forward to it. I have entirely lost my voice. I woke up this morning with nothing. I tried to make a phone call to cancel one of my sessions, and was embarrassed that it sounded like a prank call; I’m sure the person on the other end was confused by the silence. I spent the day working on e-mails and organizing my Dropbox folders. I follow Michelle Erfurt‘s Project Professional Update, and had hopes of tackling her newest e-mail inbox challenge, but did not. Alas, I did get a few hours’ worth of administrative tasks accomplished. I hope I find my voice tomorrow. I am especially drawn to his first, second, third, and sixth bullet points. Nearly all of my clients do not use speech, and, in music, I am hoping to facilitate a “channel of communication” (page 116). To you readers who are not music therapists: Do any of these goals surprise you? How so? To you readers who are music therapists: How do you remember this text? I’m back in love with it. I venture to guess that almost everyone in any profession or occupation has some semblance of a vision for himself. Over these past few days, when it’s still well below freezing and even degrees below zero here in Minneapolis, I’ve had some trouble getting ahead of my day. One vague goal I have (I call it “vague” because I don’t really know how to measure it) is to design my day and not let it and all its circumstances drag me unwillingly all the way to bedtime. Sometimes this happens. I suppose having a young baby has something to do with this, but nonetheless, I want to be the designer. What is my vision? I’d been out of the habit of writing down my schedule and my goals and my lists and my innumerable want-t0/need-to-dos. I’d been typing them into my phone or my Google calendar. While this is functional, I don’t experience the act of planning and seeing as I do when I write it down. This week, I’m trying to get back into the habit of writing. Journaling is still a far-off activity at this point, but even writing out what I want to do with my day is serving me well. I haven’t clarified my vision for my business yet, even though Empower U Academy has challenged its members to do so. I have vision for my clients, but for my career as a whole? I have not written it out. This being said, my writing prompt for March is to define your vision. I invite you to write one sentence, one paragraph, one page, or more, if you’d like. This doesn’t have to be pertaining specifically to your professional life. This can be even a very short-term vision. There is so much writing out there about finding your vision, so let this be some practice for that act. Contact me with your submission. Have it in to me by March 15. Find January’s guest submission here. I’ve written about the role of patience in music therapy sessions before, and I’ve come up against it again. I find it exceedingly difficult to manage the juxtaposition of task management and creation of therapeutic space. Therapeutic space is vast and filled by the client and all of the people, things, and ideas he needs to bring with him; task management is all of the noise and pieces that clamor around outside, hopefully serving to keep out extraneous bits from getting where they shouldn’t go. The session inside the space needs to be as quiet as it can be before the client enters. How in the world does one keep these two parts of the self-employed therapist life living harmoniously? Dump the thoughts onto paper before going into a session. Accept imperfection, but expect improvement. What is your definition of therapeutic space? *In last week’s post, I mentioned my three priorities for the week. Gladly, I accomplished them all.